The day was busy preparing, organising and styling our space for our women’s circle, which was mostly for us to get together but also for my birthday. 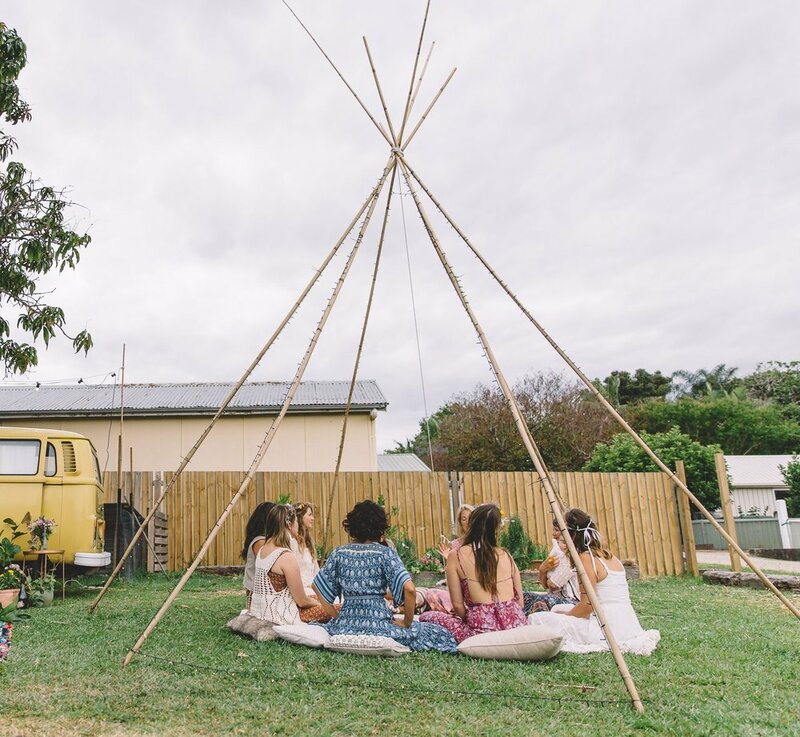 It was a huge thing to organise and only an hour or so before everyone was to arrive we hadn’t even arranged the naked teepee, which was to be our space for the circle. Eventually my neighbour helped set it up, even adding the fairy lights (which were amazing later on!) and was an angel sent from heaven. Everything just fell into place as the girls arrived and everyone assumed a job. By the time everyone had arrived the space was looking fabulous and the food platters were gold star (thanks Nicole!!! ), all fit for queens. We sat around the low table, eyes googling the food and chatting about whether we should just eat first(!) when someone let slip that they were pregnant! (not me by the way). It was a beautiful surprise to start the circle with and secretly we had been waiting for our girl to announce that. We have all known each other since we were pregnant with our first born’s, meeting in our various pregnancy support classes and after birth ‘mama baking’ together. We have been meeting regularly since then and all attended each others mama blessings for our second and third babies. So I guess you could say we know each other pretty well. The circle began shortly after with M smudging and cleansing us from tip to toe. Now I don’t actually smudge that often but the smell of the sage together with the floral’s smelt absolutely divine and so grounding. It was such a beautiful way to start a circle and prepare for sharing. When we were all seated M led a short, relaxing and arriving meditation. She then asked us to think of a couple of words to send around the group as we held hands. I must note here that the privacy of a woman’s circle is that whatever is shared in the circle stays in the circle – for confidentiality to each member. However I can say all of us sitting together was very powerful, focussing on each other as a group. I felt so much love and connection. Tears were already welling within me. After that M asked us to say a few words about how everyone met (me) and then a few words about how we were feeling and where each of us were, in short, were at in life. It sounds like an intense thing to ask but because of the circle space with everyone listening to the speaker, it creates a special atmosphere, that is respectful and non-judgemental. Going around the circle I was amazed at what came out. These women had seen me. It was only in circle, where time was set aside specifically to share and listen, that these feelings were able to be shared. I’m still so amazed and filled with love and gratitude for everyone’s words. When each expressed their own story I witnessed so much bravery, courage and honesty. Their were tears and laughter, sadness and joy. All witnessed, all heard and all held by each other. This to me is the real sisterhood. Women lifting and supporting women. And in our case mums helping mums. I think we all came away with a better understanding of each other and possibly ourselves. I was totally uplifted and feeling love from the ritual, the listening and sharing, and the birthday circle. A very special thank you to M. for hosting this wonderful moment and facilitating a beautiful circle. All my heartfelt thanks and love . p.s. Even though this was a women’s circle for a birthday, the circles for a mama blessing or bride to be are similar – all gathering to support, bless and well wish a sister. Did I mention how delicious the food was???!! !